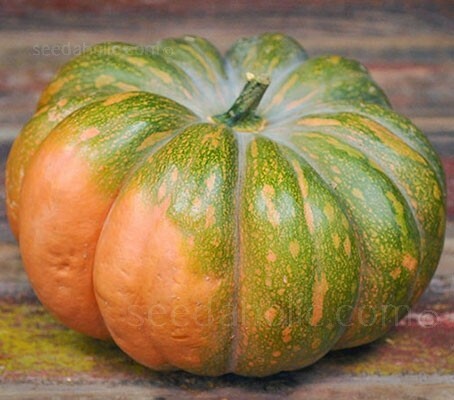 Looking exactly like fairy tale pumpkins in children’s storybooks, Musquée de Provence is a gorgeous French pumpkin, an heirloom from the 1800's, that is flat and heavily lobed with a very smooth hard surface. 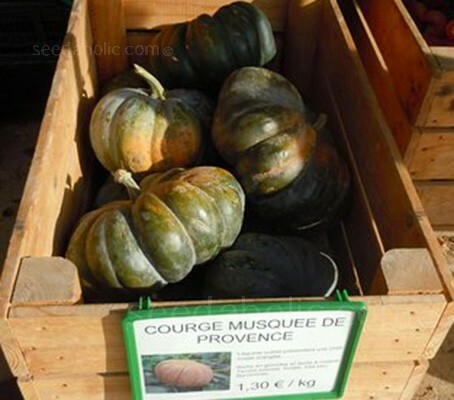 Musquée de Provence pumpkins are a mottled forest green when immature, they ripen to a rich bronze-blue-green and as they cure, turn a gorgeous deep mahogany colour. The flesh is deep brilliant-orange, fine grained, dense and meaty, it keeps a good texture when cooked. The very fine-grained flesh is considered by many to be superior to any other for baking, pies, pancakes, soups or roasting. They almost beg to be roasted to caramelise the sugars and enrichen the flavour. 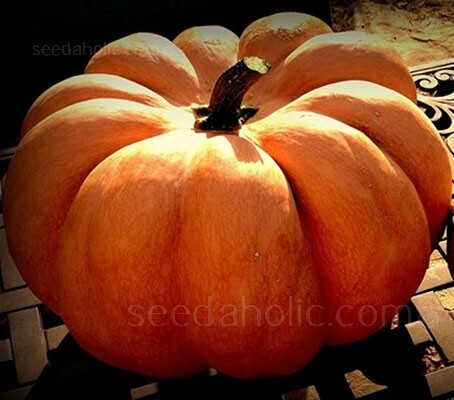 They are particularly well-suited for pumpkin pie and the deep amber colour makes the best-looking squash soup. An extremely long keeper, just as delicious after keeping for months as they are fresh. Choose a sunny, sheltered spot with moisture retentive, humus rich soil. Improve the soil by digging in some well-rotted manure or compost. The simplest way is to dig a hole 30cm (12in) deep and 45cm (18in) across and fill it with well rotted compost or manure. Cover with a 15 to 20cm (6 to 8in) layer of soil to make a raised mound that will provide drainage along with a rich source of nutrients. To get the best results ensure you have good, nutritious growing compost and that you feed them through the season. Germination of pumpkin seeds is about two weeks and requires temperatures above 20°C (68°F). If grown entirely in a heated greenhouse seed can be sown in situ in late winter, or early spring for transplanting to a cloche or cold frame. If you do not have any glass, then delay sowing pumpkin seed until late spring to avoid damage from heavy frost. Fill a 7.5cm (3in) pot with compost and firm gently. Sow a seed on its side, not flat. (reduces the risk of damping off) 12mm (½in) deep and cover. (You may choose to sow two seeds per pot, and remove the weaker seedling later; the strongest plants are kept.) Label, water and put in a propagator or on a windowsill. Germination should take place 10 to 14 days later. If temperatures are higher it may only be 4 to 6 days. After germination the young plants will grow very quickly and will need repotting almost at once. When roots begin to show through the bottom of the pot, transplant to a 12.5cm (5in) container. Hardened off before planting them outside, around late May/early June and all danger of frost has passed. If seedlings are planted out too early, and exposed to a period of cold weather, it can set back their development for the whole growing season. Early sowing outdoors is rarely of much benefit as the seeds may not germinate if the soil is too cold, or cold temperatures may damage young plants. Four weeks before the last frost is expected is about right. Sow two or three seeds 2.5cm (1 inch) deep on their edges under cloches or glass jars with 38 to 60cm (15 to 24in) between plants. Remove the weaker seedlings later. Hoe gently to keep the weeds down and do not let the plants dry out. Plenty of water is essential, especially when the plants are in flower and when the fruits have started to swell. Avoid splashing water on the stems of the young plants. Apply a mulch of about 12mm (1in) deep of grass cuttings or compost after watering. This helps conserve soil moisture and keeps the weeds down. If you dig in plenty of manure before planting, additional feeding is unnecessary on heavy, fertile soil. On sandy or light soil, regular liquid feed will help boost production. Plants under glass should be hand pollinated. The female flowers are distinguished by the swelling below the bloom. Male flowers have a prominent central core, bearing yellow pollen. The male flower is first to appear and the female flowers will follow. To hand pollinate, remove the petals from a male flower; push the core into the centre of the female flower. For a high success rate, use a different male for each female flower. Harvesting: Harvest August through October. Around 120 days. Winter squashes need as much as three to five months of frost-free conditions after sowing to reach maturity. They can be harvested whenever they are a deep, solid colour and the rind is hard enough to resist being punctured by a thumbnail. Harvest in late September or early October, before heavy frosts. Fruits subjected to a hard frost will not keep, so harvest should be completed before cold weather. Store them in a moderately warm, dry place until Halloween. Cut the pumpkins from the vines carefully, using pruning shears or a sharp knife and leave 7 to 10cm (3 to 4in) of stem attached. Snapping the stems from the vines results in many broken or missing 'handles'. 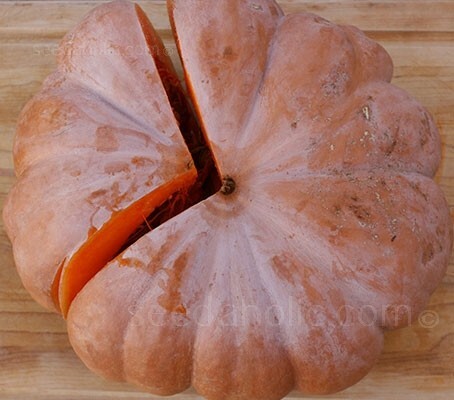 Pumpkins without stems usually do not keep well. Wear gloves when harvesting fruit because many varieties have prickles on their stems. Leave the fruits as long as possible to ripen in situ, wait until the mottled green skin has begun to turn burnt orange before cutting them free and place them on a table or stand in the warmth of the polytunnel or similar for a good month so the skins can harden. Cut the fruit from the vine and place it in a well-ventilated place out of direct sunlight. Clean the squash in a very week, (10 percent) chlorine-bleach solution to reduce the chances of mould ruining the fruit. Handle with care, and avoid damaging the stem, because if it breaks off, disease can move in and cause spoilage. After curing for two to three weeks, store at 10 to 15°C (50 to 60°F) with a relative humidity of 50 to 70 percent (dry basements work well) until you are ready to use them. Musquée de Provence have a sweet dry flesh and store well. Store only those fruit that are free of cuts, wounds, and insect or disease damage. Immediately after harvest, the fruit should undergo a ripening or curing process to harden the shell. A curing period of about two weeks at 24 to 30°C (75 to 85°F) with good circulation is desirable. They can then be stored at temperatures of around 10 to 20°C (50 to 70°F). By the time it has been cured, the seeds are mature. Cut open, remove the pulp and seeds, and rinse off the pulp. Put the mixture in a bowl of water to remove the remaining pulp, the good seeds will sink. Remove the good seeds and spread them out to dry for 2 to 3 weeks, stirring them at times to make sure they dry completely. Store the seeds in a cool, dry place, they will remain viable for up to 4 years. Winter squashes belong to the genus Cucurbita, they fall into four domesticated species groups: C. maxima, C. moschata, C. argyrosperma, and C. pepo. Native to Central America and northern South America where it was first domesticated, Cucurbita moschata is a monoecious, creeping, vine-like annual that trails along the ground or climbs by tendrils. It produces a variety of fruits which vary considerably in size and shape due to large genetic variation within this species. Young leaves, flowers, shoot tips, fruits and seeds are edible. However, the fruits are usually not harvested when young, but are left on the plant to mature for eventual autumn harvest as winter squashes. The genus name Cucurbita comes from the Latin name for a gourd. The specific epithet moschata means musky, it is given to a number of classes of plants that give off a mild scent (ie some rose species). References to 'pumpkins' date back many centuries. The name pumpkin originated from the Greek word for 'large melon' which is 'pepon', which was nasalised by the French into 'pompon'. The English changed pompon to 'Pumpion'. Shakespeare referred to the 'pumpion' in his Merry Wives of Windsor. American colonists changed 'pumpion' into 'pumpkin'. The 'pumpkin' is referred to in The Legend of Sleepy Hollow, Peter, Peter, Pumpkin Eater and Cinderella. The origin of pumpkin pie occurred when the colonists sliced off the pumpkin top, removed the seeds, and filled the insides with milk, spices and honey. The pumpkin was then baked in hot ashes. Moisture retentive, humus rich soil. Sow indoors in pots April to June or sow direct from mid May to early June. Harvest August through October. Around 95 days.